While DML and DDL triggers work based on changes to the data or objects in a database, logon triggers detect when users log on to the server and execute stored procedures in response to this. Typical uses for logon triggers include keeping track of user activity, restricting access to SQL Server and maintaining a limit to the number of concurrent users. Expand the Server Objects folder followed by the Triggers folder to find your Logon triggers. You can drop, alter, disable and enable logon triggers using the same methods as for other types of trigger. You can also change the order in which logon triggers fire using the sp_settriggerorder system stored procedure. When do Logon Triggers Fire? The answer to this question seems obvious: when a user logs on! It's worth considering exactly what this means in terms of what you can do within a logon trigger. According to Microsoft's TechNet site a logon trigger fires when the authentication stage of logging on has finished but before the user session is actually established. This means that if your trigger is designed to show messages to the user (using the PRINT statement for example) the user won't ever see them. Two of the more useful columns from this output are login_name and is_user_process. The example shown below prevents a certain user from establishing any more connections to the server when they already have three connections open. The ORIGINAL_LOGIN function shown in the code above returns the name of the user who is logging in. In the WHERE clause of the query we're testing if the is_user_process column contains a value of 1 (i.e. it is a user process), and if the original_login_name column is equal to the user whose sessions we're trying to limit. This is part of the error message that will appear. 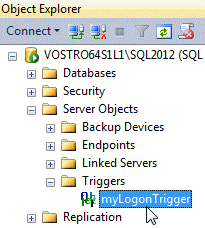 Take care when creating logon triggers as you can fairly easily find yourself unable to connect to a SQL Server instance! If this happens you'll need somebody who is part of the sysadmin role to connect and disable or delete the trigger.